Dennis and I are no strangers to small house living. 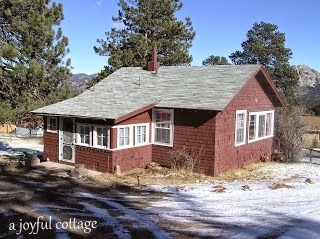 In April 2011 we purchased and remodeled a 640 sq ft cottage in the Colorado Rockies. This was our full-time home until July 2013 when we sold it and relocated to Oregon. 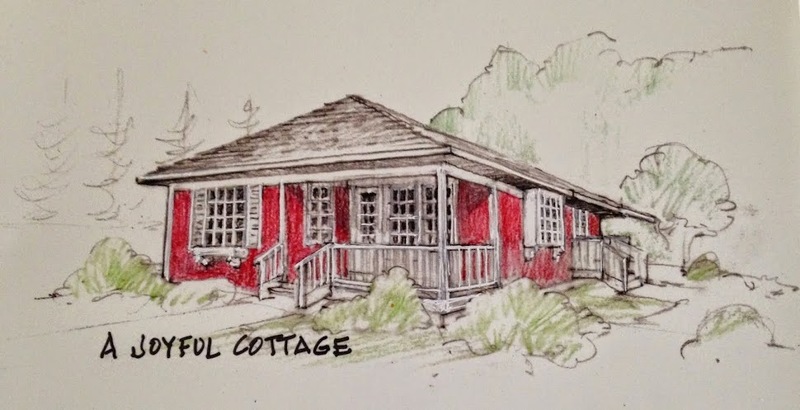 It took three months to remodel the 1926 cottage. We hired a friend to help us and with the exception of the hardwood floor refinishing, kitchen cabinetry and countertop installation, plumbing, electrical and new roof, we did all the work ourselves. Dennis called it a "Cowboy Cabin"
This and all the before photos that follow were taken the day we closed on our cottage purchase. 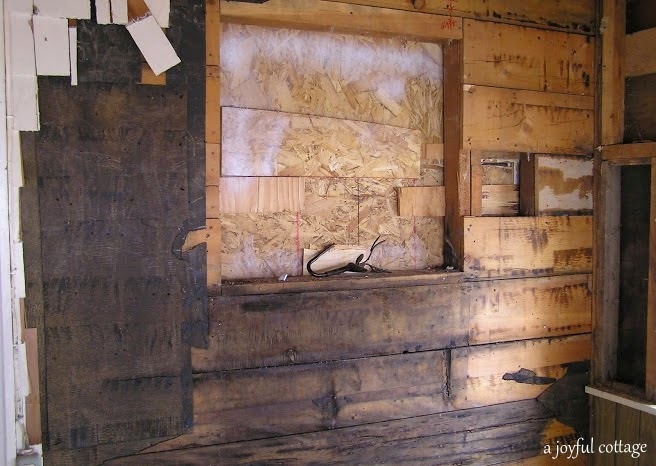 A piece of plywood covered what originally had been the bathroom window. 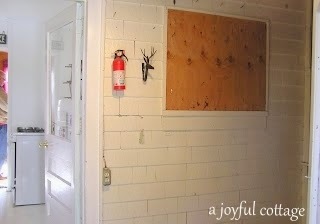 Previous owners had removed the glass, put wallboard directly over the window opening on the bathroom side, and the plywood on the mudroom side. A door on the left opened to a stairwell. At the bottom was a tiny, dark basement where the water heater was located. Dark vinyl paneling covered the other walls. The minimal kitchen was probably last updated in the 1950's. Mice had left their calling cards in the shallow cupboards and drawers. 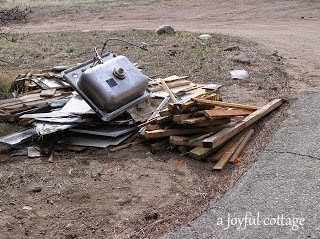 The newer gas range, however, was in very good condition. 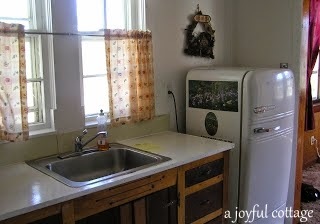 We sold the vintage refrigerator. While interesting, it was an energy hog. 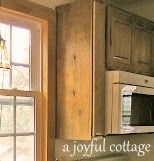 Whatever changes we intended for the kitchen, I wanted to maintain the look of those wonderful windows. 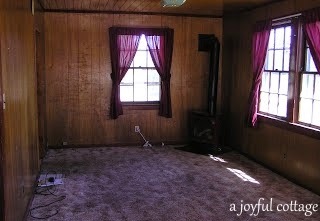 More dark paneling along with drab carpet and maroon curtains gave the living room a cave-like feeling. On a positive note, there was a charming red gas heating stove in the corner, a gorgeous hardwood ceiling, and adequate natural light. 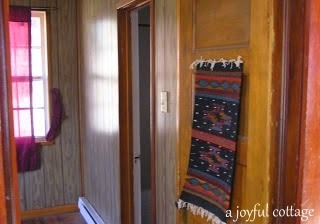 The front door was located at the opposite end of the living room. (A dilapidated deck barely stood outside; one side was propped up by a lilac bush.) 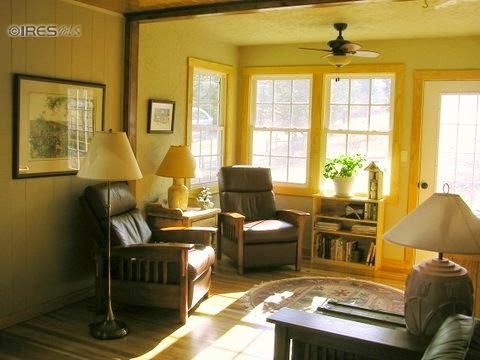 The area where the white walls begin was probably a porch converted into additional living space. 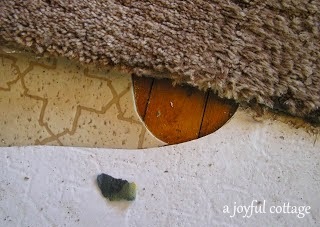 The little rug on the door was covering up a fist-sized hole. 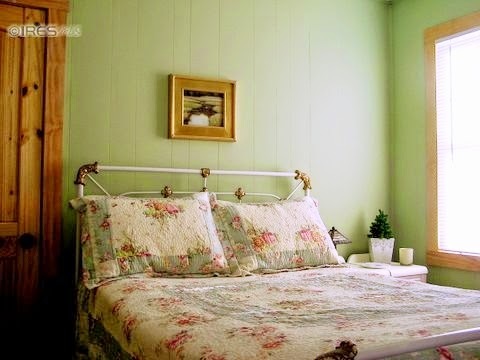 There wasn't anything special about the bedroom except the hardwood floor. 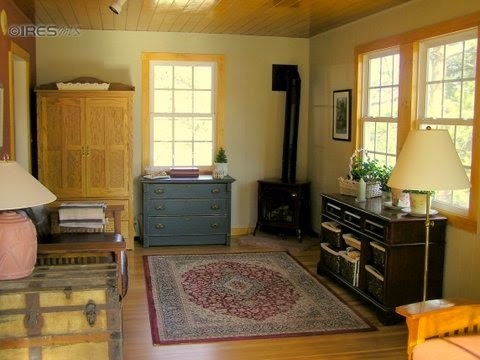 When I saw it I suspected there were hardwood floors throughout the cottage. 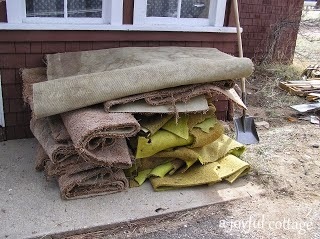 I couldn't wait to pull up the carpet and find out. Accessed from the bedroom, the bathroom was one of the smallest I've ever seen in a stick-built house; a 4' tub/shower combo, a tiny vanity, and a commode were crammed into the space. 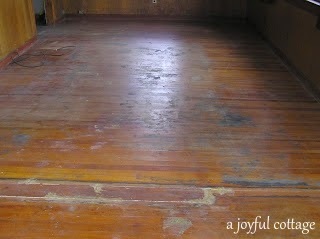 Will we have hardwood floors? The day after closing I pulled up all the carpet. My suspicion was confirmed -- hardwood floors. Even in the kitchen under two layers of linoleum. The first room we gutted was the kitchen. 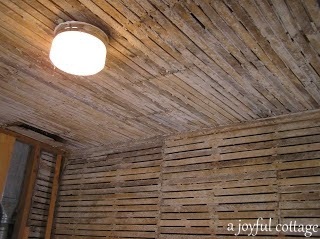 The walls were lath and plaster, typical for the home's age. Bathroom demolition revealed dry rot and mold from shower and bathtub leaks, so most of the walls and flooring had to be removed and rebuilt. 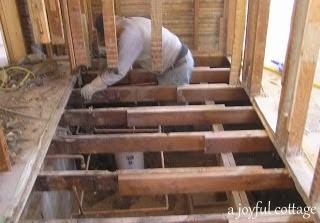 The tall crawl space proved very beneficial to our remodel, especially for the electricians and plumbers. 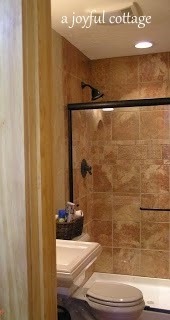 We planned to enlarge the bathroom by taking space from a walk-in closet, its frame seen at the top of the photo. 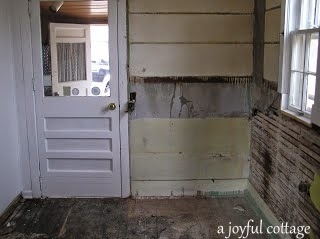 The only other room we gutted was the mudroom. It took several days for the flooring contractor to refinish our hardwood floors, and we couldn't have been happier with his work. He was thrilled to discover the heart pine wood -- a hardwood that he said isn't common to the area -- and believed it was probably shipped in at the time the cottage was built. 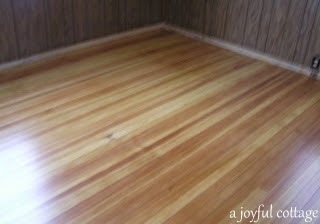 Because the floor refinishing came first to accommodate the contractor's schedule and we still had the rest of the remodeling work to do in the cottage, we covered the finished floors with Ramboard, a product that protects the floor while allowing it to cure. 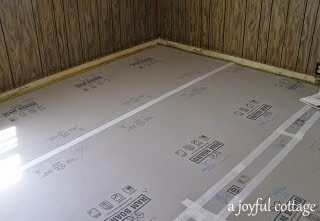 It took us four hours to roll out the Ramboard in three rooms and tape it down; well worth the effort when one considers how expensive it is to have floors refinished. 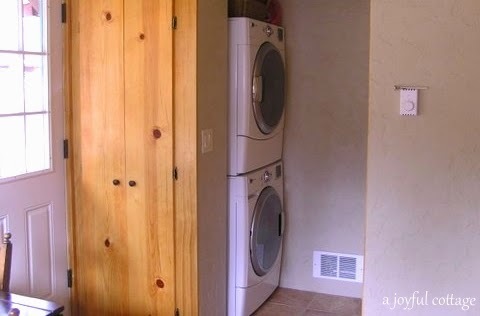 Removing the stairwell gave us room for a built-in pantry and stacked full-size washer and dryer. 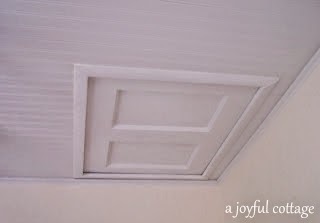 Dennis raised the ceiling at the entrance to accommodate a standard height entry door. By moving the kitchen door over we made space for a closet opposite the washer/dryer. 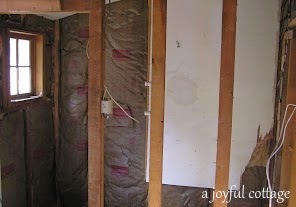 We created a new access to the basement -- where the water heater is located -- from inside the closet. A door on the floor lifts up to reveal a ladder to the cellar. We enlarged the windows and added a shelf for plants. 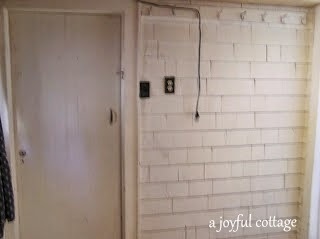 A door to the bathroom from the mudroom was added. 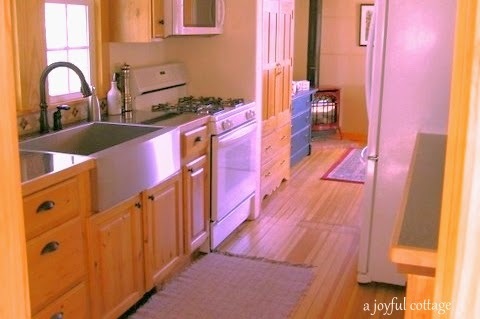 The knotty maple cabinets came from a friend's custom kitchen showroom. He had dismantled a display and gave us a super deal. 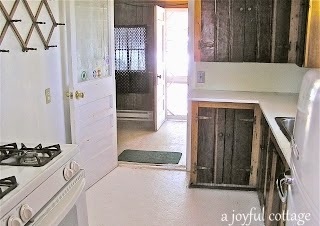 I handed him my kitchen design and he customized the cabinets to fit, including adapting the sink base to accommodate the stainless steel farm sink. 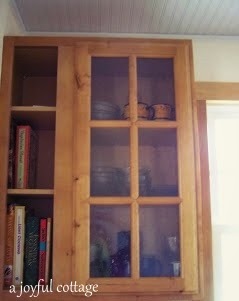 He cut down a wall cabinet and added shelves for cookbooks, and wavy glass to the cabinet door for the vintage look I wanted. To fill the gap between the OTR microwave and window, he built a pull-out spice rack. 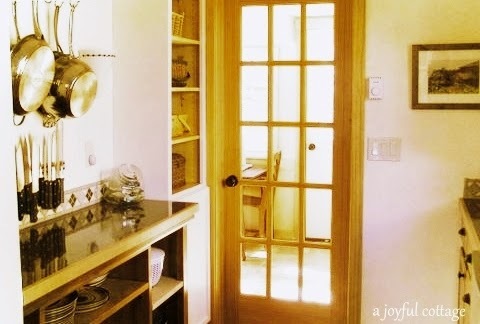 The French door leads to the mudroom. We reused the range; all other appliances were purchased new as a package from one supplier. A friend made the wall cabinet for us. Decorative baskets on the shelves double as storage. 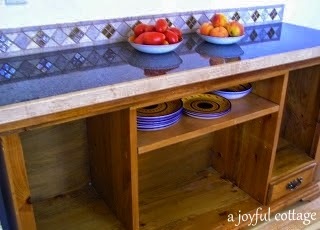 The open shelved counter-height unit is a repurposed $40 cabinet we found at a local thrift shop. Our cabinet guy added the countertop, which matched the rest of the Wilsonart laminate. I replaced the drawer pulls shown here with cup pulls to match the other kitchen hardware, and Dennis made additional shelves for storage (not shown in this photo). 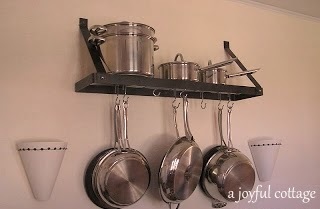 I found a pot rack on Craigslist for $15 and spray painted it black to cover the less than desirable gun metal gray. 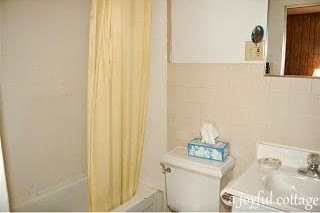 This photo is from our real estate listing. The console under the double windows is part of my staging. We actually used that area for dining. 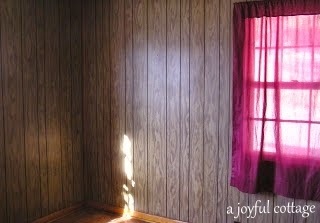 I painted over the dark paneling with Valspar Wicker. Serendipitously, a friend had salvaged five gallons of the paint, leftover from a hotel renovation, and asked me if I wanted it for our remodel. 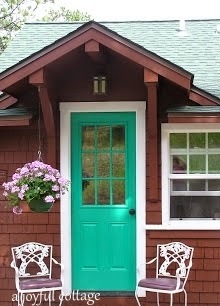 The color was perfect for the cottage, and I was able to cover all the walls and new ceilings in the living room, bath and mudroom at no cost for the paint. 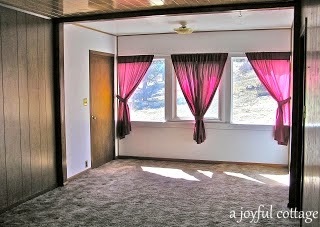 This portion of the living room received a dramatic transformation. 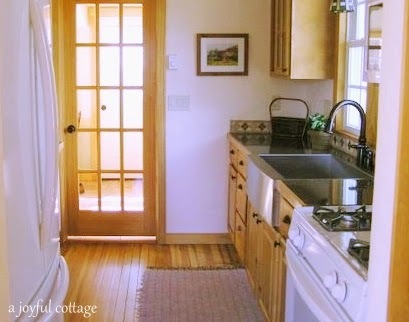 Dennis moved the door and installed windows to match those in the rest of the cottage. We left the paneling on three walls and I painted it. 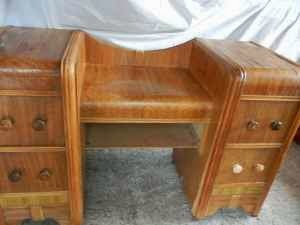 The nightstand is repurposed from a 1940's vanity I found at a thrift store for $20. It was in rough shape and missing a mirror. Not the actual vanity, but close. 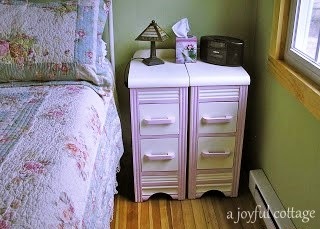 Dennis cut off the drawer units and I painted them to match colors in our comforter. We set the little finished tables side by side in the space between the bed and the wall to create a nightstand the ideal size. 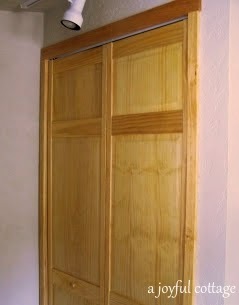 The wardrobe in the corner is a repurposed pantry unit from the kitchen display mentioned earlier. Dennis installed a hanging rod in the lower section. The top section held drawer units that he could easily reach. I used the armoire for my things. We retained access to the bathroom from the bedroom, but moved the door over a bit to make room for the shower and a cadet heater. The spacious shower replaced the old closet. 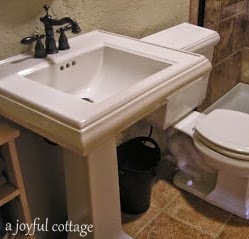 We were able to reuse the existing commode, as it was in great shape, and ordered a pedestal sink from the same Kohler collection. 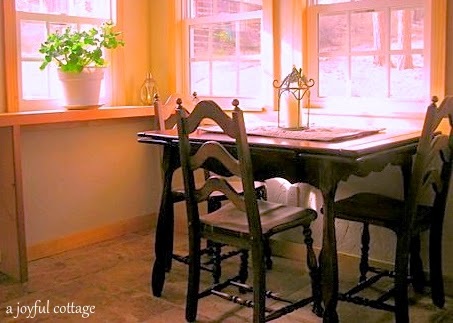 Dennis, who worked his way through college as a stonemason/bricklayer, enjoyed doing the tile work and all the heavy texture on the new walls and ceilings in the cottage. I took this photo the day we completed the exterior remodel. Do you think we made a difference? And this one just before we sold the cottage two years later. Isn't the native grass beautiful? Dennis worked so hard to get it established. Lovely setting you were in Nancy. Love the Art Studio and you Small Home. Exciting to see what your next chapter will be. I think the creating is the fun part. Then when the creating part is finished it gives room for new ideas to emerge . . . thus, more creating! What fun the two of you must be having! I love your old place, it was truly beautiful. I understand the mortage thing. We are hoping to get this house ready for sale when Hubby retires and pay the next house off in full too. We also want a smaller house. Just love this little home and studio. Where in Colorado is this. Is it near Estes? My daughter and I rode through there this spring. I couldn't believe the damage that flood caused. The roads were still far from being restored. You husband is a talented artist for sure. I'm sure your new home will be cozy and sweet like this one. Love small homes. This is in Estes, Debby. We left before the floods hit, but many of our friends have had to deal with the devastation. One of them lost their home completely. Very sad. I can't imagine selling this. I could stay there forever. I guess in doing this you got to do whatever you missed doing the last time. Have fun. Thanks. We would have been happy to stay there, but I don't think it would have been the best decision long term. Hugs. Oh Nancy what a sweet home and wonderful studio barn for your hubby. 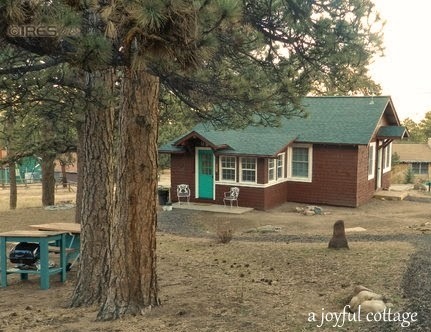 I think it is hard to always leave such memories and pretty places but I know you will love building another cute home for retirement in Oregon. Loved seeing all your furry neighbors in your old home. Have a wonderful rest of the week end. Thank you, Kris. Your words are very encouraging. Hugs. So inspiring! I'm seriously considering going smaller when hubby retires in 5 years. Seeing your photos and reading your story confirms that you can actually have so much more in life by living big in a small space. Thanks for sharing this. So much inspiration surrounding this lovely home, it's no wonder both you and Dennis produced such beautiful artistic works of art. I'm excited about your next home and look forward to following you on your journey. P.S. Your backdoor buddies are TOO cute!! I'm glad you're enjoying the series, Dianne. Thanks for the kind words. 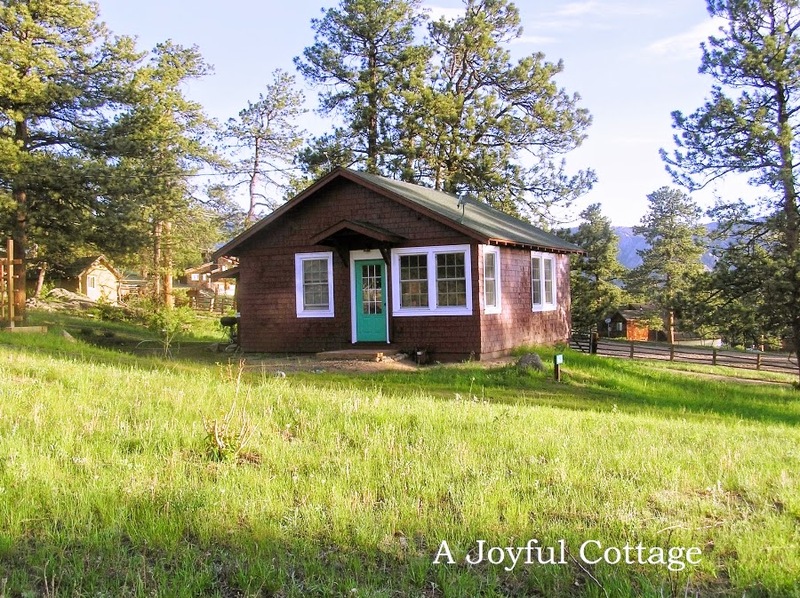 Really enjoyed your pictures of your lovely little cabin in Colorado. I totally understand your dream of living debt-free and think that your sacrifice of selling your home in CO will be worth it, plus living in gorgeous Oregon isn't that bad of a trade-off!! Your ideas for storage in small places were really neat too. I look forward to following you on your journey as you decide what to build in Oregon :) And hey - we're neighbors - sort of... I'm just a few hours north of you! Beautiful glorious country up here, I might add! Thank you for sharing. Love your blog and appreciate the honesty. What a wonderful makeover. I love the large window with the mountain view.. And the artwork is lovely.. I can see why the property sold quickly, it is lovely.. Thanks for sharing, have a happy week! 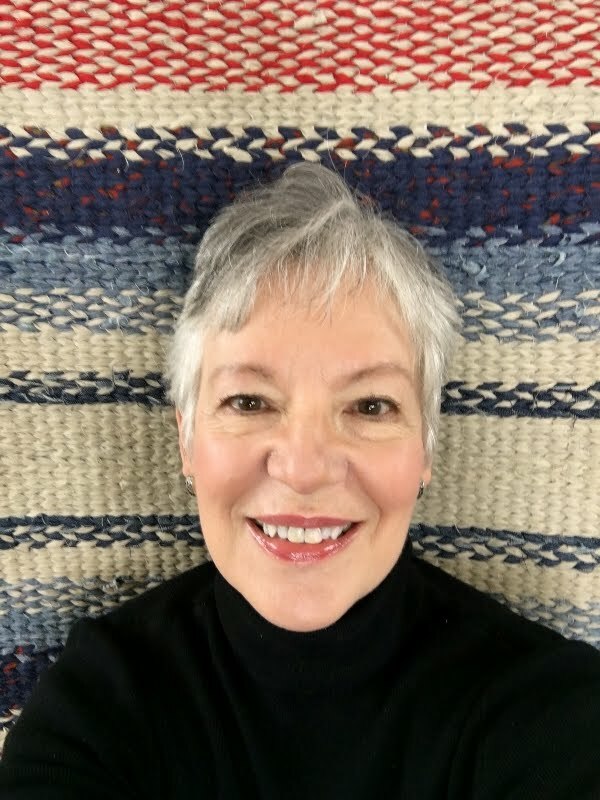 Loving your new blog. Maybe your travels will take you to Ohio? :-) Love you, friend! First of all, you're a great photographer. Secondly, I'm not surprised you sold your property so quickly, but I'm with you, no mortgage when you're retired is the way to go. Good luck in your new home. I'm sure it will be just as fabulous and inspirational. My husband would love to meet your husband and I know he would envy him all the space he has for painting. Steve does have his own studio, it's just a lot smaller. I have never regretted moving to a smaller house. It makes me think about what I really want to surround myself with. When you have plenty of storage, it is easy to accumulate "stuff". To think you had time to work on the barn as well!! I can see that it definitely had potential and I know Dennis must have been thrilled to have such a great studio. His artwork is simple beautiful! Further down I saw some of your photography...you really have a quality for catching wildlife at it's best. The cabin studio is gorgeous! Wow, you guys did an amazing job...love it! The artwork is perfectly chosen for the cabin walls. The images of the country are fabulous, what a great land there, I love the country! I would spend hours in that studio you created. Thank you for your lovely visit. Wow, Nancy! Wonderful post! I so enjoyed all of the photos! What a great studio and beautiful artwork! Thank you for sharing! I look forward to seeing more! 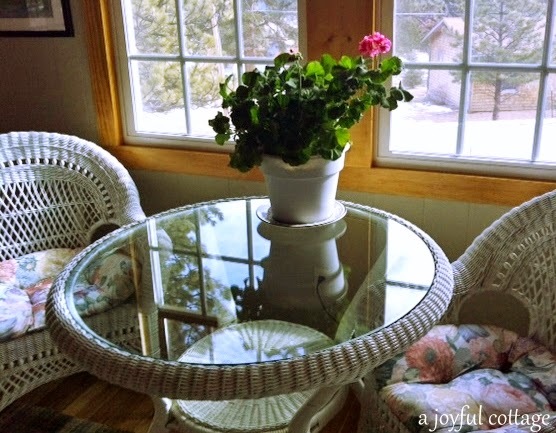 Nancy, your Colorado home was just beautiful! The wildlife in the area was just precious. Loved those twin deer! The barn made such a fabulous studio for your husband. I love Poppies and his painting is gorgeous. Thanks for sharing with SYC. The barn is amazing!! Not to mention the landscaping God provided!! 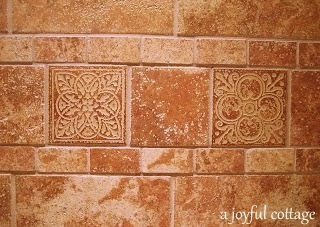 Thanks for sharing this neat series at the Art of Home-Making Mondays! :) Have a lovely weekend Nancy! What beautiful photos and love the barn studio and artwork..the scenery is breathtaking and peaceful. You're so sweet, Judy. Thank you.